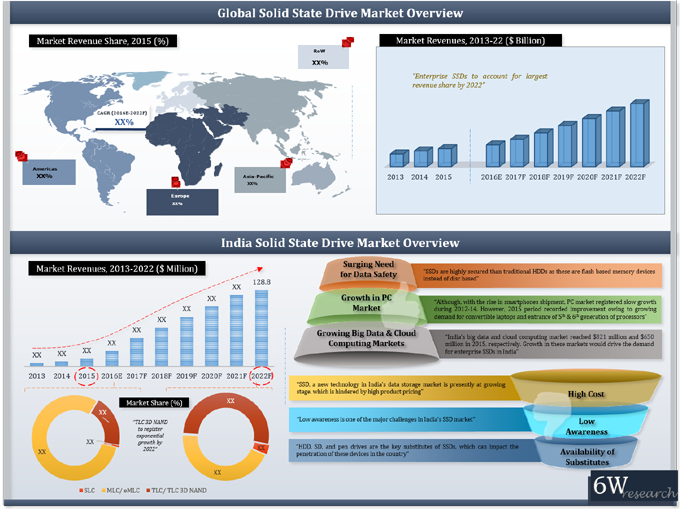 India's Solid State Drive (SSD) market has been divided into SLC SSD (SATA II, III and SAS 6GB/s), MLC/ eMLC SSD (SATA II, III, mSATA, PCIe/ NVMe, SAS 6GB/s and SAS 12GB/s) and TLC/ TLC 3D NAND SSD (SATA III, mSATA and PCIe/ NVMe). Amongst all end user market, consumer end user segment acquired largest revenue share of the market pie in the country. Over the next six years, enterprise end user segment is forecast to grow at relatively higher CAGR from 2016 to 2022. The report thoroughly covers solid state drive market by SSD types, interface types and end users. The report provides an unbiased and detailed analysis of the on-going trends, opportunities/high growth areas, market drivers which would help the stakeholders to decide and align their market strategies according to the current and future market dynamics. 13.1	ADATA Technology Co., Ltd.
13.5	Kingston Technology Company, Inc.
13.8	Samsung Electronics Co., Ltd.
India being the fastest growing market for data storage is witnessing augmented growth in high-end storage devices, primarily NAND flash memory based SSDs. Rapid rise in next generation connected devices, growing premium & high-end PC market, need for higher performance & capacity storage devices, coupled with increasing IT spending has buoyed the India SSD market. Further, surging big data and cloud computing markets to proliferate the SSD market in India, predominantly for next generation high-capacity enterprise SSDs. In India SSD market, MLC NAND flash memory segment held majority of the revenue share in 2015, which is primarily dominated by consumer application market. However, by 2022, MLC SSD segment market share is projected to decline owing to growing demand for TLC 3D NAND SSDs. Apart from growing demand for standard 1.8-2.5inch TLC 3D NAND SSDs, India SSD market is further projected to register growth in next generation form factor or NVMe based TLC 3D NAND SSDs' in the forecast period attributed to increase in market penetration.